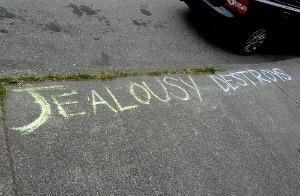 What is the best way to deal with a person who is extremely jealous? I was friends with this person for about 2 years. I recently got a great job, got married and I'm doing really well. I am constantly hearing that this person says horrible things about me to people. We used to work together and I was told that she told my old boss that I am a bad person. My old boss referred to me as "showing my dark side". This is because she bad mouthed me for no reason. I have tried to ignore this person but she continued to bad mouth me in our small occupational field. When I confront her, she just denies everything. I am really getting stressed over this. I feel so helpless in this situation. How do I deal with a person like this? Thank you! I'm in a similar position with jealousy all around (in the performing arts world). This often happens when we get a huge 'break' and a 'star' career is launched. It's normal for there to be a bit of jealousy. There's not much one can do with rumors flying around, unfortunately. We can only rise above the nastiness, remain strong, and present ourselves at our best and sincerest. Actions speak greater than words. It will take time and endurance. But there will be those who are wise enough not to believe everything they hear. Most of all, believe in yourself and don't take any that rubbish to heart. Cut out the disease from your life.